Below you can find the most frequent questions we get from our clients in relation to Iranian visa authorization process. Our answers reflect usual practices we learned over the years from Iranian officials and, of course, the actual situation. Please note that our answers cannot be taken for granted as we do not represent official Iranian visa policy (you should always double check with a relevant Iranian embassy). Do you arrange visas to Iran? No, we do not. We only arrange a visa reference number or visa authorization code that is a mandatory document to be presented at an Iranian embassy together with your Iranian visa application form or after your arrival to an international airport in Iran. What is Iranian visa reference number, Iranian visa authorization code, Iran Visa Grant Notice? All names mean the same thing. 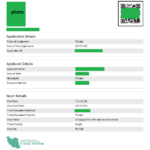 It is a code or document that is being generated by Iranian Ministry of Foreign Affairs in Tehran based on your application (through our form). The code, if you get one, means you were positively pre-screened by Iranian ministry officials who decided that you may start your visa application process and later enter Iran. This is a very important fact to know if you, for example, want to apply for your Visa On Arrival at Iranian airport as many tourists are afraid to do so. Once you have been checked by the ministry and got your code, the officer at the visa desk has no reason to deny you a 30-day visa. Iranian Ministry of Foreign Affairs as of 1. 10. 2018 introduced fixed expiration dates of the the Reference Numbers, Authorization Codes and Grant Notices which all mean the same thing. It is 1 month from the date of issue by Iranian Ministry if you want to collect your visa at any Iranian embassy or 3 months if you collect your visa on arrival at any Iranian international airports. It means you should not apply for this document too much in advance. After the expiration date of the documents is reach, the document is no longer valid and you have to reapply. How does the visa authorization code look like? As of July 2017 it is a document. Once you get it from us, you can print it and present when needed. Also, the code will be automatically sent from the Ministry to the desired Iranian embassy you specified in your application. How do I pay for the authorization code application? Is it safe? We use Paypal, the most trusted, secure and frequent online payment gateway in the world. You can use your Paypal account or pay with your debit/credit card, no registration is required. Alternatively you can make a bank transfer to our EUR account. What is the easiest way to get to Iran? then Visa on Arrival is the best option for you. Just get a visa reference number from us, present it at the airport after your arrival to get a 30-day visa, which you can then easily extend for another 30 days during your trip in Iran (see below how to extend it). If you do not meet all above criteria you have to apply for a standard tourist visa at an Iranian embassy before your visit to Iran. For what type of visa is the visa reference number required? Visa authorization code is usually required for tourist visas and visas on arrival but you should always check with a relevant Iranian consulate. What nationalities/citizens can apply for a visa on arrival? What are general requirements for getting an Iranian visa on arrival? Have a valid passport with at least 6 months validity. Pay a visa stamp fee (depending on the applicant’s nationality) at the visa & passport office at the airport. Usually between 25 – 75 EUR. Have a travel insurance valid in Iran. If you fail to present one, you will need to purchase Iranian version that cost around 15 and 25 EUR. Journalists and reporters in general. What is the duration of tourist visas? 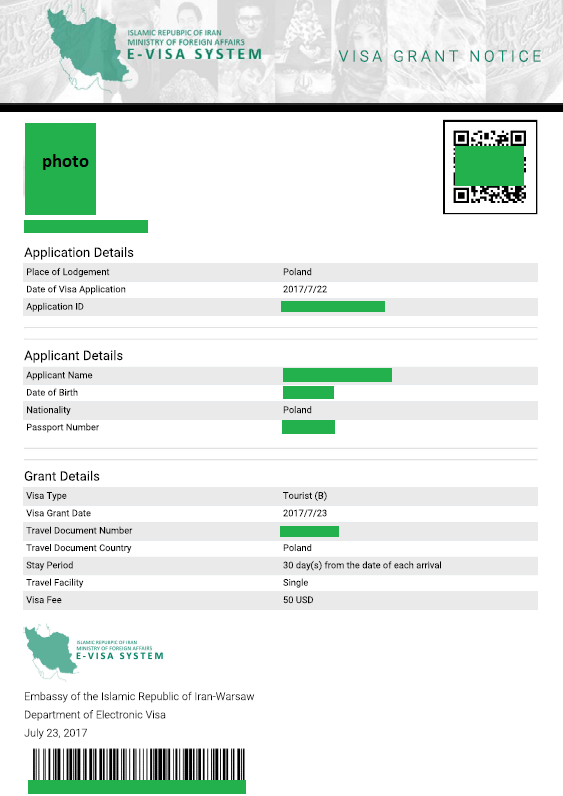 This visa is issued for a maximum stay of 30 days with options of extensions in Iran. It is valid for a period of 3 months from the date of issue at the consulate. At which Iranian airports can I get a visa on arrival? How to extend your visa in Iran? You can extend your Iranian visa by the same original duration without a problem which means that 2-week on-arrival visas can be easily extended for another 2 weeks, 30-day tourist visas can be extended for another 30 days. The difficulty of obtaining your visa extension varies from city to city. Arguably, Tabriz is said to be the worst place for visa extension (even with rejections), while Shiraz the easiest and most reliable option. You can get your visa extended in a matter of the same day (Shiraz) or few days (Tehran). Visa extensions are usually issued from the day you show up at any Police Office of Foreign Aliens except for Shiraz or Yazd which reportedly issues visa extensions from the end date of your visa. Shiraz – immigration office is on Moddarres Blvd, near Vali-e Asr Sq. Esfahan – Roudaki St, near Azadi Sq,. Tehran – two offices, either Dr. Fatemi Junction or Sepah sq. Mashhad’s – next to Azad University, Rahnamaee St. There are also travel agencies in Iran that will get your visa extended for a fee, of course.